A large and growing amount of electricity is exported out of Ontario at prices far below what Ontario's common ratepayers pay. How this happens is complicated, but the reason it happens is not: influential groups of people benefit. In the parlance of Ontario's electricity scam, these influential people are called "stakeholders." This post is about one aspect of a system designed solely for stakeholders. I've been writing on the costs of exports for over 4 years, primarily focused on analysis of data I've captured and/or queried. I've not been particularly entertained by doing it for about 4 years. January 2015 saw a record for net exports (exports less imports), and in the past it wouldn't have taken me long to run up a blog post saying so. In this post I'll use numbers, primarily on exports, to tell a story of influential people, and their suckers. Maybe I'll get you to want a tax. I've revisited data from the National Energy Board (NEB), and connecting figures uncovered there to previous work I've done, I'll explain an obscure but apparently growing profit centre designed into the IESO's operation of an electricity market. The IESO does not attempt to recover the full cost of supply in operating their market. In January maybe 38% of the costs of providing supply were recovered by selling at market rates, and that was better than they do most months. To estimate the money involved from the arbitrage of Ontario's electricity, the value of the purchases on the Ontario market is needed, along with the value of the resale of that electricity in other markets. Fortunately, there's data to estimate both. Data is never perfect, and the data sets compared in this chart are no exception. 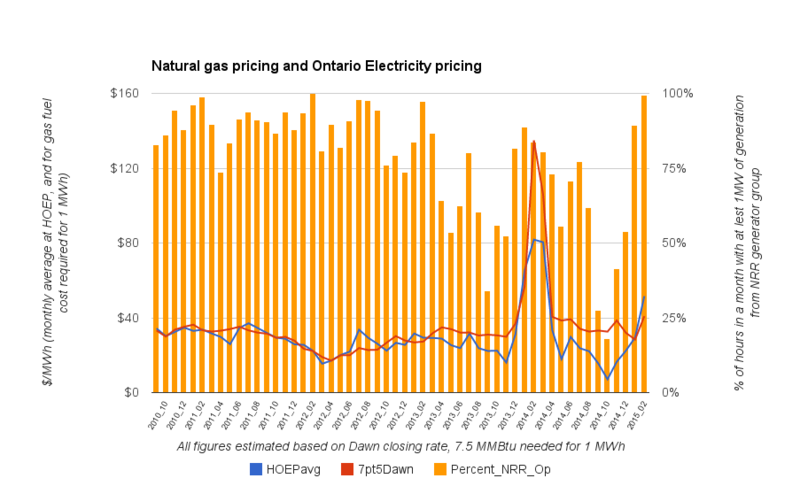 There are important differences between the National Energy Board (NEB) data and the data from the operator of Ontario's gamed electricity market (the IESO). The differences most likely mean the chart underestimates traders' sales revenue from exports. Wholesalers buy energy on the wholesale market...Exporters export electricity from Ontario into these neighbouring jurisdictions. Sales out of the country require documentation be filed with the National Energy Board (NEB). It is the wholesaler purchasing the electricity in the IESO market that makes the sale. It is the wholesaler purchasing the electricity in the IESO market that makes the money. There are groups benefiting from purchasing cheap power in Ontario's intentionally depressed market and selling it for more elsewhere. The NEB data reports on the end destination of foreign sales by exporters, which need not be the jurisdiction sharing a grid intertie with Ontario. NEB sales exceed the amount of electricity that moves into the United States through Ontario's interties with the U.S., meaning much of the electricity Ontario flows into Quebec is wheeled through to U.S. destinations. This means that the NEB revenues underestimate the end consumer value of Ontario's exports as they don't include electrons exported to service end consumers in other provinces - despite growing increasingly higher than the IESO valuation of the exported power. Over the past six or seven years, Ontario has beefed up its electricity exports and made $5-$6 billion selling excess electricity, says IESO President and CEO Bruce Campbell. Months into this statement being challenged, Steve Paikin confirmed that statement was "an error", and the $5-$6 billion was a revenue figure in line with my own estimates. January 2015 indicates Ontario is a major exporter not only when it must dump surplus capacity - although during the shoulder season's that is the case. 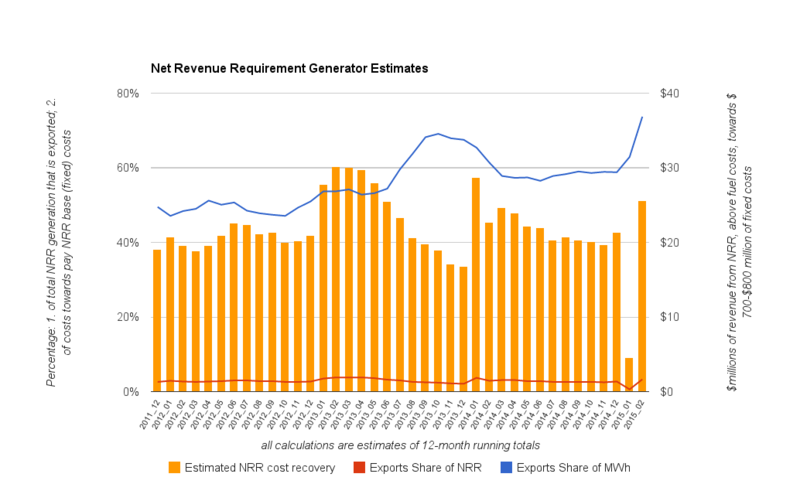 In January, these assumptions mean that of 1.275 terawatt-hours (TWh) generated by the NRR sites, 1.03 TWh would be considered as being generated for export markets. This makes December far different than October, when the NRR units rarely operated. While in October most exports were due to dumping purchases made due to contracts at much, much higher rates, 58% of January's 1.785 TWh of net exports were sold to wholesalers at around the cost of the fuel. This may sound like good news: the incremental cost of wind under feed-in tariff (FIT) contracts is $135, so selling it at $45 feels like a loss while here we sell at $45 something we pay $41 for. However, Ontario ratepayers likely pay close to $800 million a year to cover the capital and operational costs (plus a return on investment deemed reasonable) under the net revenue requirement (NRR) contracts. The IESO doesn't even attempt to structure their market to recover these costs. My analysis shows the natural gas-fired powered plants Ontario procured with NRR contracts generate about 60% of their output for exports, but cost recoveries, above fuel costs, cover about 3% of the base NRR contract costs. 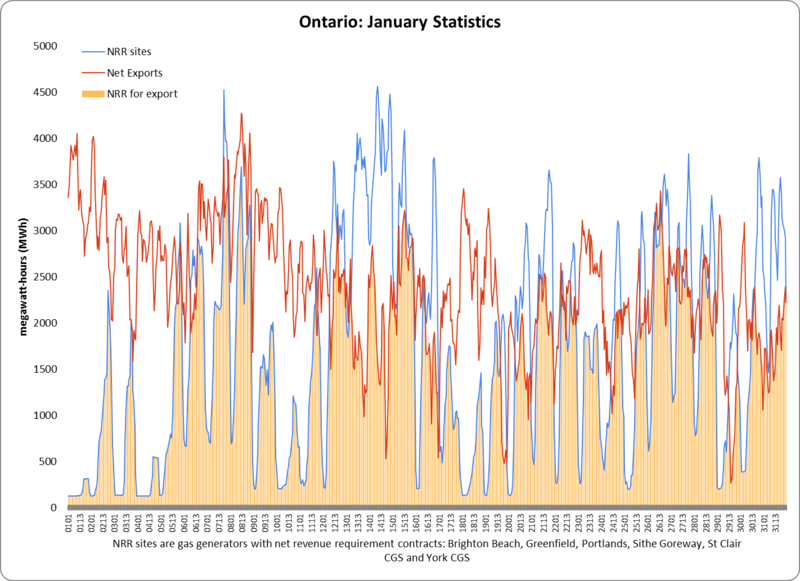 This is why Ontario set a record for net exports in January - one it will likely break in February an an hourly average basis.Natural gas-fired generation where the bulk of the cost is embedded in the Ontario's ratepayers charge regardless of market price. This is why the opportunity for arbitrage profits is great. Ontario's export of power year round leads to the assumption Ontario loses money on it year round. This is so complicated an issue that I've written specifically on a number of ways to estimate Ontario's losses on electricity exports. The large arbitrage margin indicated for 2014 demonstrates the IESO's scheme is not maximizing the value of the generation Ontarians are forced to purchase - or, more accurately for this post, it is not attempting to add value to the generating capacity Ontarians are forced to purchase. 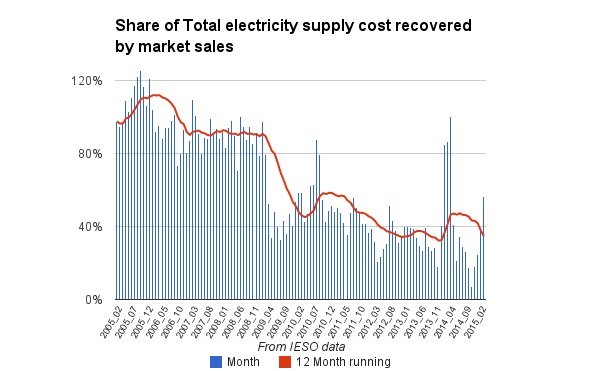 I've suggested recovering a far greater share of capacity costs through the implementation of a carbon tax within the electricity sector, and the start of 2015 has demonstrated I've been correct from a standpoint of generating value for end consumers. I doubt the stakeholders are interested. 1. The IESO's January reporting shows an "average export schedule" of 2747 MW (megawatts), an "average import schedule" for the month of 348 MW, and an "average net intertie schedule" of 2,399 MW. It is not without relevance that if you tallied up the month's Intertie Schedule and Flow Report to calculate the average "net" export, this is not the figure you'd get (2,566 MW is), but I will leave the meaning in the difference for another day, aside from citing it as an instance of poor data discipline. 2,399 MW more electricity exported than imported every hour means 1,785,240 megawatts for the month. This is 13.6% of the IESO's reported "Ontario Demand". The Hourly Ontario Energy Price (HOEP) is shown as having a weighted average of $29.55/MWh (everybody presumably pays this). This makes the market value of electricity "demanded" in Ontario $388 million, The global adjustment reflects the price of supply the market failed to recover: it was $628.2 million - meaning the IESO's market recovered only 38% of the cost of supply. 2. 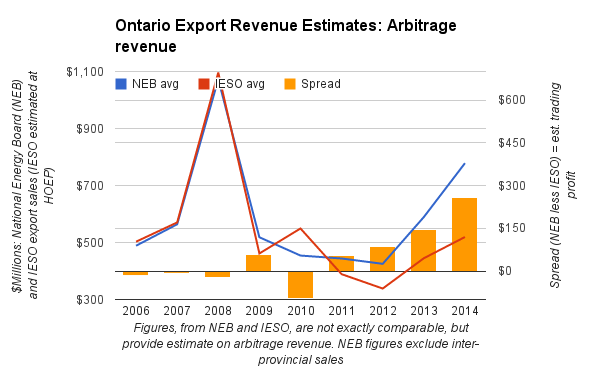 Here's one piece of evidence that the IESO did once release revenue figures on export sales: September 2012 Ontario Electricity Exports Bulletin. Note the dead link listed under "Additional Resources": Learn more about Ontario’s electricity imports and exports. My recollection is the figures were usually ~10% higher than my estimation at HOEP which both encouraged me that my estimates were not too far off, and confirmed the IESO could present the figures. 3. The highest accepted bid into the market should set the market clearing price (MCP) - and the HOEP is the average of the 12 5-minute MCP's in an hour. Any generator that must be accepted regardless bids extremely low (their rates being guaranteed anyway). Functionally, this is why gas should be the supply on the margin (setting the price).